India is facing one of its worst water crises in decades. About 300 districts in 12 states are dealing with drinking water shortage. Over 600 million people depending on agriculture and nearly two-thirds of the land have no irrigation provision and solely rely on rain. This has put the entire agriculture in jeopardy. Famers are suffering the most. About 12,000 farmers commit suicide in India, annually. On January 10, 2017, Tamil Nadu was declared drought-hit. This came after 40 farmers protested outside Trichy collector’s office, holding dead rats in their mouths. What can be the reasons behind this intense shortage? Let us take a look. As stated by NASA, groundwater status report is said to be the worst in India. The water table is falling on the average by 0.3 metres to as much as 4 metres in some regions. In 2009, out of the total amount of groundwater extracted, 89% was for irrigation while 11% constituted of household consumption. The problem with groundwater is its decentralized usage. India has an estimated 30 million groundwater structures, according to the July 2016 Government Report. The lack of Government regulation further worsens the problem. As a result, the rate at which groundwater is being consumed, exceeds the rate of its replenishment through rainfall, seepage from canals and other water bodies. Another major issue with ground water is its depleting quality. A steep fall is resulted by domestic sewage, industrial effluents, pollution by landfills, septic tanks, over and reckless use of pesticides and fertilizers. 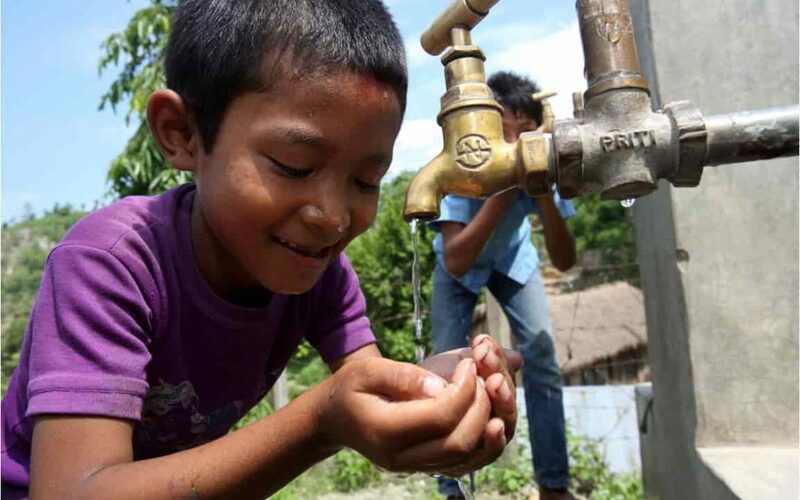 As many as 68 districts in 10 cities are affected by high arsenic contamination in groundwater. Punjab, Uttar Pradesh, Jharkhand, Bihar, West Bengal, Assam have been most affected. Another significant source of water supply is the surface water resources. The supply of water in cities that depend on surface water is being disturbed by increased population, pollution and increased wastage. Central Pollution Control Board (CPCB) measured toxic metals in 120 rivers. CPCB reports 1145 Grossly Pollution Industries (GPIs) in the country which are devoid of effluent treatment facilities and are discharging wastewater into rivers and lakes. In 2014-15, India exported 37.2 lakh tonnes of Basmati. 10 trillion litres of water was used to carry out this export. According to Water Footprint Network, India has the lowest virtual imports of water in the world. On the contrary, India is the largest virtual exporter of water due to its agricultural products. India, being water scarce country, is exporting more water than it should import, leading to great water loss. Low tariffs and defective meter coverage has left no real economic incentives for Indian consumers to economize water use. Only a handful of metropolitan cities – Bangalore, Pune, Mumbai, Kochi have ‘nearly’ achieved universal meter coverage. In other cities, only 62% of the households are metered, while in smaller cities, it falls down to 50%. Official meter coverage figures overstate the true data because meters are often non- fictional due to low quality of equipment, intermittent nature of supply and deliberate damage caused by households. Many settlers end upping less than the actual usage. Water tariffs are unable to raise enough revenue to cover the service provision cost. The charges levied on residential users are less than a tenth of the likely full economics cost – about Rs. 1.5 cubic per meter – only about one-tenth of operating and maintenance cost. Therefore, to promote economic efficiency, customers must be metered and measured tariffs must reflect the incremental cost of developing new water sources. The issue of over-consumption is so grave that even a country like China, having a larger population uses 28% less fresh water than India. Moreover, subsidized electricity is indirectly exhausting water resources. Indian farmers pump up more groundwater than China and America combined. The policies and water protection provisions will succeed only if the government manages to rectify the existing loopholes in its policies. Water distribution network need to be made leakage free (as much as 40% water in some cases are lost due to leakages and overflows). This will not only mitigate the current risks on water supply, but also help in its sustainable usage. At the same time, there is an urgent need to change the consumption pattern of people. Those who have access to water need to conserve. It is an irony that in spite of being a water surplus country and continuing to receive ample rains, India is fast turning into a water stressed country. (This article has been written by Vaishnavi Tyagi, B.A. Hons. Economics, University of Delhi).